This phrase originated with Peter Drucker, an American-Austrian management consultant, but was made famous by Mark Fields, the President and CEO of Ford. They say that when there is a disconnect between the two…culture will win every time. According to Investopedia, “Culture” can be defined as the “beliefs and behaviors that determine how a company’s employees and management interact and handle outside business transactions”. In other words it is the actual day to day actions that are prevalent in the company. What do people actually do everyday? What behaviours are actually present in the company? What beliefs are behind those behaviours? No matter how many times a business leader may say it, the culture of a company is not the 5 Cs that are on the plaque as you enter at reception. The true culture of the company is what is exhibited in the employees outworking of their daily tasks, the emails that are sent, the conversations around the water cooler and the behind the scenes conduct in business deals. Case in point in South Africa today: KPMG. On their values page they describe how they do what they do and what they believe in. These contain fantastic values and point to a great culture. However, the reality on the ground was different and the true culture behind the scenes was unfortunately not quite aligned to their strategy of being the best audit firm having been accused of being involved in some dubious activity. So the strategy is the plan and actions that a company will lay out as optimal for business success…while the company culture is the actual on the ground behaviours that occur within a company. Thus…if the culture and strategy are not aligned then any business will be doomed to swim in circles until it drowns. So how does a company align culture and strategy? This is a great question – and needs to be the beginning of a number of great questions. While this will not be a comprehensive plan to fixing the ailments in every business…it is a start and a helpful one at that. This is different from defining the current culture as you may not be aware of what is actually going on. What do people really believe about the workplace and what really goes on day to day? There may be fear or lack of buy in. There may be people working harder than you could ever imagine and not being recognised. There may be uncovered gems and there may be some employees who are not on the right track. 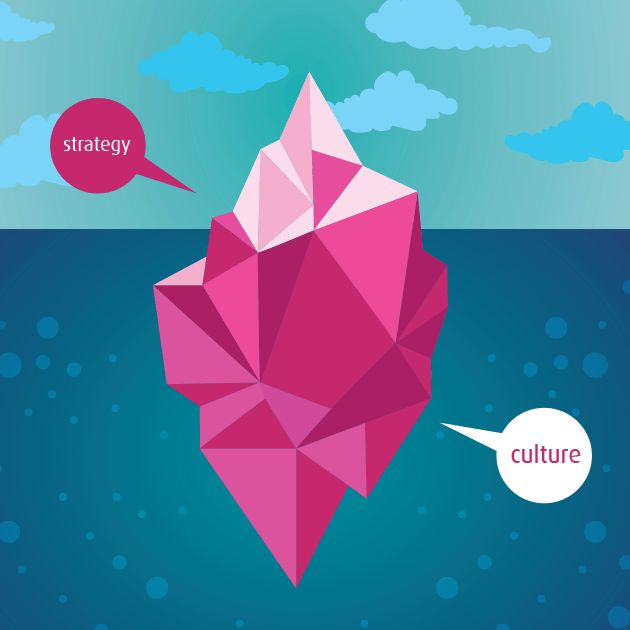 The culture might be incredibly healthy but very misaligned to the strategy plan. You might need some external help here from an objective party. What is the strategy that your company is currently outworking? Is it effective? Does it need some revisiting? Ask some tough questions about the performance and effect of the current plan on the people. Are people playing in position? Are the goals achievable? Are the goals clearly defined? Are there multiple ways to achieve the same end or is the path quite well defined? Once the current culture has been assessed and the current strategy has been investigated you can see how they align. If they do…amazing! Well done. If they don’t…you have some work to do and some questions to ask. The powerful thing about staying flexible and continuing to ask questions is that there is space for learning and improvement. If you can define a preferred future for the company then you will need to figure out some next steps as to how to get there. It might mean hiring new people, or changing the job descriptions of the people already in the team. If we can assist in providing you some world class recruitment services then feel free to get hold of us and let’s have a coffee to discuss how best to see your company flourish with top talent!